YEREVAN (Armenpress)—The collection of the Armenian Genocide Museum-Institute has been completed with the addition of new cartographic materials. Armenpress reported from the Armenian Genocide Museum-Institute that these American, German, and British cartographic materials are of great interest, as the borders of Turkey already declared Republican exist there. Accordingly, the eastern boundary of Turkey runs along the border which was laid out by the arbitral resolution of the USA’s 28th President, Woodrow Wilson. These cartographic materials are the best evidence of the fact that even after the Republic of Armenia’s inclusion in the USSR and the proclamation of the Republic of Turkey, the border between Armenia and Turkey was considered to be the one established by the U.S. President in November 1920, which did not undergo any changes by an international agreement and was not considered null. The Armenian Genocide Museum opened its doors in 1995, concurrently commemorating the eightieth anniversary of the Genocide. During its years of activity the Museum has received many visitors, including schoolchildren, college students and an unprecedented number of tourists both local and foreign. The museum provides guided tours in Armenian, Russian, English, French and German. The Republic of Armenia has made visiting the Armenian Genocide Museum part of the official state protocol and many foreign official delegations have already visited the museum. These delegations have included Pope John Paul II, Russian President Vladimir Putin, French President Jacques Chirac, and other well-known social and political figures. The impressive two-story building is built directly into the side of a hill so as not to detract from the imposing presence of the Genocide Monument nearby. The roof of the Museum is flat and covered with concrete tiles. 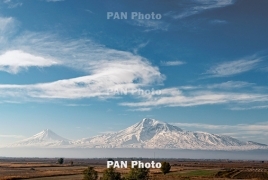 It overlooks the scenic Ararat Valley and majestic Mount Ararat. The first floor of the Museum is subterranean and houses the administrative, engineering and technical maintenance offices as well as Komitas Hall, which seats 170 people. Here also are situated the storage rooms for museum artifacts and scientific objects, as well as a library and a reading hall. The Museum exhibit is located on the second floor in a space just over 1000 square meters. There are three main indoor exhibit halls and an outer gallery with its own hall. The Genocide Monument is built for the remembrance of the innocent victims of the first Genocide of the 20th century. The Genocide Museum’s mission statement is rooted in the fact that understanding the Armenian Genocide is an important step in preventing similar future tragedies, in keeping with the notion that those who forget the past are condemned to repeat it. An exhibition of maps that represents some key moments in the Armenian history opened in Bratislava, Slovakia on November 6. Set to run through November 15,the exhibition at the Ministry of Culture is dedicated to the 25th anniversary of the establishment of diplomatic relations between Armenia and Slovakia, Pravda reports. In particular, maps created by ancient Greek-Roman geographers as well as medieval Islamic, Latin and Western European cartographers and geographers are currently on display. "The end of the 19th century and the first quarter of the 20th century are full of traumatic experiences for the Armenian people living on the territory of their ancestors," the publication says. "The maps represent a significant part of key cartographic heritage of mankind, with only a few maps made by Armenian experts." A similar exhibition, also unveiling Armenia through ancient maps opened in Latvia in late October and is set to run through November 26.